We have had quite a few grey days here in California, and this type of weather inspires me to want curl up in my sweats and shovel something calorie laden and warm in my mouth, otherwise known as comfort food. Just be forewarned that if you are a vegetarian you should definitely avert your eyes from this post! I've never been a fan of meatloaf, but for some reason I was inspired to make it a few days ago. 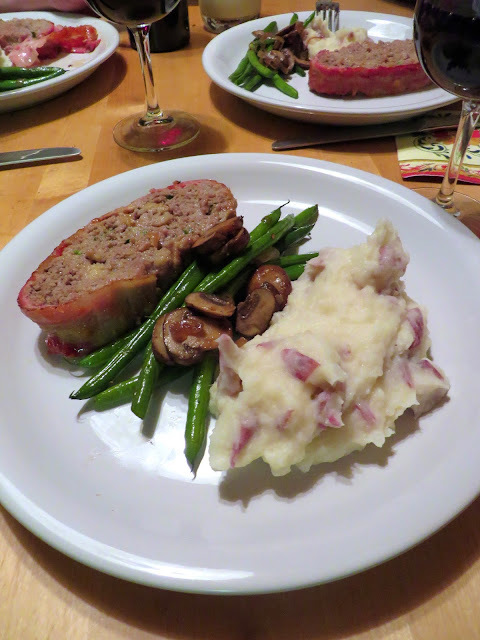 I had a recollection of Ree Drummond, more notably dubbed "The Pioneer Woman", making a bacon wrapped meatloaf on her TV show that I thought I would try. Let me just pause for a moment to say I love Ree and here's why: She lives on an incredible cattle ranch, she has two of the cutest Basset Hounds ever, everything she cooks looks incredible and she isn't afraid to use heaping amounts of cheese, and last of all she seems genuinely, sincerely nice. While much of the above doesn't necessitate being a good cook (with the exception of the cheese thing), the Pioneer Woman's recipe (at least in this case) really came through. Just look at the end result below! So I won't take you step by step through the process. Do you really want to look at a bunch of pictures of gooey meat like the one below? I'm not sure how you make this look good, but I will provide the link to The Pioneer Woman's recipe here. Go check it out! I don't even like meatloaf, but this one has it all: bacon, Parmesan cheese, and a lovely BBQ sauce. Eeew! Raw ground, mushy beef. Is it weird that combining all of the ingredients: ground beef, milk, bread, eggs, etc. with my hands turned out to be oddly therapeutic? While Ree the Pioneer Woman's recipe was near perfect in my book, I would just make one small adjustment: more sauce! Feel free to double or even quadruple the recipe for the BBQ sauce that goes on top and is a dipping sauce, I didn't have nearly enough. I would also recommend serving your "loaf" with some sides like mashed potatoes (I don't have a recipe, but just add lots and lots of butter) and green beans and mushrooms. I used this recipe here from Martha Stewart. I make these sometimes for Thanksgiving as a side if you're looking for ideas! Above you will see that I am working on my "plating" skills. If you've ever watched a reality cooking show you'll understand that plating and making your dish look elegant and appealing is half the battle. I thought this tuned out picture perfect and yummy too! Try it yourself if you're in the mood to get comfy and cozy! Bon Appetit!